Ever wondered why you find it soothing when it rains or when you hear raindrops pelting on the roof? What if you can recreate this sound and feeling in your bathroom by installing one of the best rain shower heads available in the market? Installing the best rainfall shower head is a great way to bring the soft and soothing feeling of rain that you get in spas and rejuvenation centres which use fountains and rain music to create that experience. 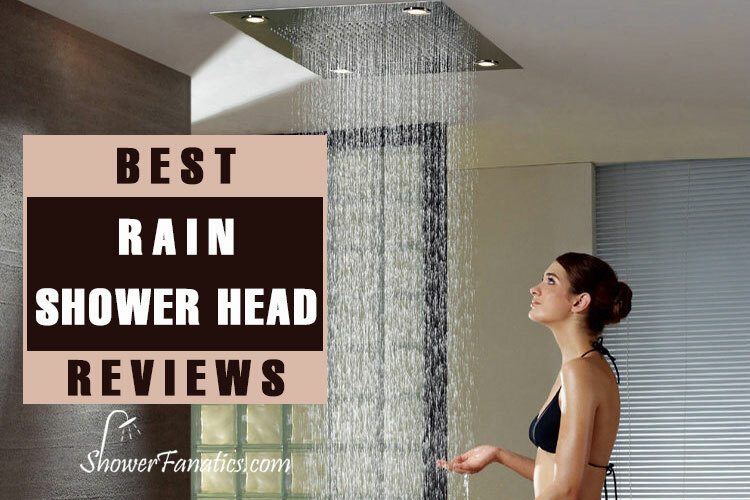 We have compiled a detailed guide with some of the best rain shower head reviews for you to check out so that you can make your shower experience a lot more soothing. Our top pick for the best rain shower head is the Moen S6320. With variety of color options and use of immersion technology, this showerhead is completely worth the money. It is also quite easy to install and gives you two spray settings to choose from. The spray power of this showerhead is also better as compared to the other models and this is why it features at the top in our list of best rain shower heads of 2018-2019. Our bathroom experts have done ample research for compiling these detailed reviews and this buying guide will help you find the right rain shower head for your bathroom. You can also refer to this comparison table which will make it easier for you to look at all the features of all the models so that you can get a model worth your money. With four color options to choose from, the Moen rain shower head has an 8-inch shower head made using immersion technology to provide better spray volume. The four color finishes include brushed gold, brushed nickel, brushed bronze, and chrome. The chrome variant is highly reflective and works well for modern bathrooms. The adjustable water flow feature helps the user to select between rain shower spray and concentrated rinse mode. With 2.5 gallons of water per minute, the water pressure in this shower head is perfect for a soothing morning shower. The immersion technology used in the shower helps you experience that beautiful drizzling rainfall shower every day. Has four colors and finishes to choose from and the chrome variant suits modern bathrooms well with its reflective finish. Uses immersion technology with two-function spray setting for providing better spray volume. The quality of the shower head and its attractive design make it worth the price. It comes with a limited lifetime guarantee for any manufacturing defects. The shower head holes begin to clog after some time and need frequent cleaning. The price of the brushed gold model is very high. This rain shower head from Moen has a very attractive design and the reflective chrome finish adds a modern touch to the bathroom. The immersion technology used in the shower head is perfect for both spray showers and concentrated rinse modes. If you are looking for a large rain shower head, this model from Hansgrohe is a good option to consider. It is an amazing showerhead if you are looking for a lot of coverage and want to feel a downpour. The model is available in brushed nickel and chrome finishes and comes with flexible silicon nozzles that are quite easy to clean for lime scale deposits. The showerhead is made using AIRPower technology which infuses the water with air and gives you a misty shower. The model comes with a 1-year warranty and has a flow rate of 2.5 gallons per minute. The price of this showerhead lies in the premium range. The AirPower technology results in fuller water droplets and provides an intense but mist-like rain shower. The 10″ width of the showerhead provides more coverage and more water volume. The nozzles of the showerhead are made up of silicon and are quite easy to clean. The 26 degree swivel angle of the showerhead gives the user a spa-like experience. The price of the showerhead is very high as compared to other models. The water pressure might seem too soft to some users. The width of this rain showerhead is quite good for people who want a bigger coverage. The AirPower technology makes you feel like you are standing under a natural downpour and the silicone nozzles makes it a breeze to clean the shower head and remove lime scale deposits. One of the most affordable rain showerheads in the market, this model from Waterpik is very popular for its quality and price. It is available in two variants which offer water flow rate of 2 GPM and 2.5 GPM. This showerhead is available in just one finish which is chrome. The 6″ inch showerhead is good for smaller bathrooms and is made using OptiFlow technology which delivers more water pressure over a larger area. The assembly is also pretty easy as you can install it on any existing shower arm or extender. The design and quality of the showerhead is very good as compared to its price. The price of this rain showerhead is quite affordable as compared to its quality. You can choose between 2 GPM and 2.5 GPM as per your requirements. The size of the showerhead is good for smaller bathrooms or for people who like rounder smaller showerheads. The OptiFlow technology maximizes water pressure and makes it cover a wider area. The small round showerhead does not exactly give a feel of a proper rain shower. The shower arm bends after a few months of use as it is made up of plastic. This is a perfect rain showerhead for smaller spaces and is great in terms of quality. The design of the showerhead is such that you get to experience a rainfall experience without having to go for complex assembly or maintenance. The price is so affordable that it is no longer considered expensive to install a rain shower in your bathroom. One of the biggest rain showerheads you can find in the market, the American standard rain shower head boasts of a 10″ showerhead in two color variants which include polished chrome and satin nickel. It looks quite modern and minimalistic. It is a ceiling mounted showerhead which is very easy to clean because of the brass construction. With a limited lifetime warranty, the showerhead delivers well on all its promises and is quite easy to assemble too. It gives 2.5 GPM flow rate which is considered standard for rain showers. The price is reasonable if you choose the polished chrome variant. The size of the showerhead is 10″ which is great for enjoying luxurious showers with more coverage. The model gives a relaxing shower flow rather than an intense one. The flow rate is good and it is quite easy to clean. The model is ceiling-mounted so there is no need for a shower arm or an extender. The design of the showerhead might look very plain to some users. The price can seem expensive if you choose the satin nickel variant. This showerhead has one of the largest widths you can find in rain showerheads so you should definitely go for it if you need something with more coverage and a sleek look for your modern bathroom. Another minimalistic and comparatively affordable rain showerhead, the Delta Raincan comes with just a single setting and has a traditional showerhead design. It can be mounted on the ceiling or through a traditional shower arm as per your convenience and offers a 2.5 GPM water flow rate which is quite good if you want to get a steady and powerful stream of water. It has touch-clean spray holes which can be cleaned by just wiping with a clean cloth. The model comes with a limited lifetime warranty and is available in a classy chrome finish. The price of the showerhead is moderate but you can buy it at some discount online. Has a minimalist and simple design which is easy to clean and looks great in chrome finish. It can be mounted using a shower arm or through the ceiling as per the décor requirements. The touch-clean spray holes make it easy to remove scale deposits from the showerhead surface. It releases a steady stream of water with good pressure and covers the entire body. It comes with a single setting so you cannot change the stream pattern or water flow rate. The pressure is lesser than expected according to some of the users. The coverage of this showerhead is great as compared to its size and the low-maintenance factor makes it worth the investment. It is quite flexible in terms of installation and delivers a steady stream of water. If you are looking for a complete shower system and not just a rain showerhead, then you can go for this wall-mounted rainfall showerhead system from SR which comes with a rain showerhead and a shower arm along with a mixer valve and a concealed shower bracket holder. This is the best rain shower system and consists of a 10″ rain showerhead made up of stainless steel and 15.7″ brass shower arm. A brass pressure balancing mixer valve helps you to choose your favorite settings in terms of pressure and temperature. The best rain shower head combo is available in two variants and is priced relatively higher as compared to single rain showerheads. The components of this shower system transform the bathroom completely and look great together. The shower arm and the rainfall showerhead system look very classy and are of the right size for full coverage. The balancing mixer helps to control temperature and water flow rate for desired shower experience. It is also available in 12″ rain showerhead variant for more coverage and better experience. The rain showerhead is a little flimsy as compared to other models. The price of the system is a bit high since it comes with many components. 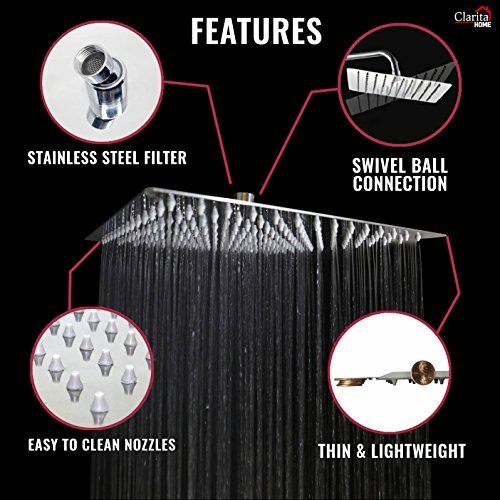 If you are going for a complete remodel of your shower area, you can definitely consider this rain shower head with handheld spray which fulfills all your shower needs with its superior finish and great performance. The 10″ rain showerhead works very well in mimicking the natural rain effect. 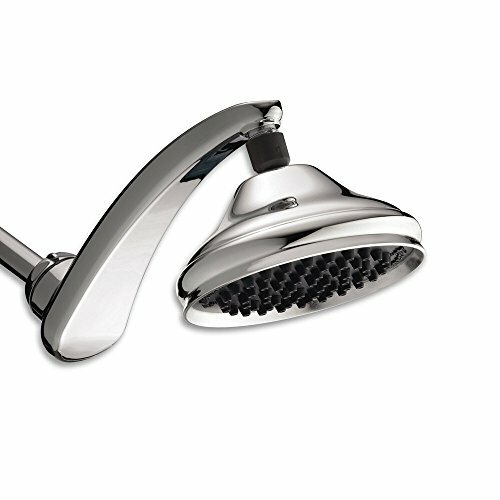 A large rain showerhead at a very affordable price, this 12″ showerhead is fitted with 196 nozzles and is made up of stainless steel. The highly reflective chrome finish is very durable and does not get affected by corrosion. With a water flow rate of 2.5 GPM, this showerhead is very easy to install and gives the actual rainfall experience when you step inside the shower area. It is compatible with all the standard shower arms and swivels to the desired angle. The thin and lightweight design of this showerhead and its ease of cleaning make it completely worth the price. The 12″ width of the showerhead is great for bigger bathrooms and offers a great rainfall experience. The showerhead is very lightweight and is quite easy to install. It does not corrode and the highly reflective chrome finish works well for most bathrooms. The price of the showerhead is very affordable. Some of the nozzles can get clogged with use. The showerhead begins to rust and leak from the edges if not fitted properly. This rain showerhead is used in many hotels and is a very affordable choice for modern homes. The size is great and the design is easy to install and clean. The mirror finish makes it go well with existing bathroom fittings. 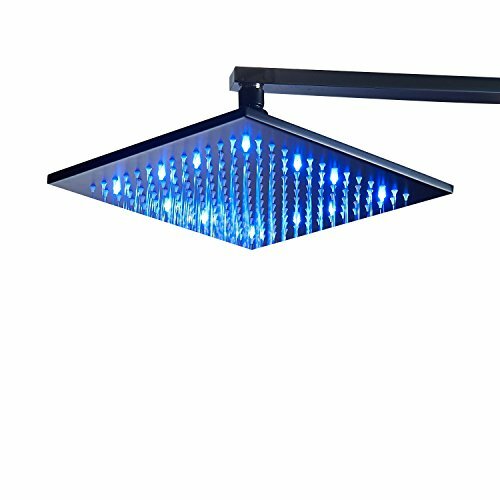 Fitted with color-changing lights that change with the water temperature, this 10″ LED rain shower head comes in four very stylish variants and has 196 nozzles to deliver an authentic rain shower experience. This showerhead is also available without LED lights if some users prefer it that way. It is made up of stainless steel and is fitted with LED lights which change color between blue, purple, and red according to the temperature of the water. The showerhead also swivels in all directions and comes with a plumbing tape which makes it easy to install. The price of the showerhead is reasonable and the non-LED version is cheaper as compared to the LED version. The LED lights fitted in the showerhead change with water temperature and give a spa-like soothing feel. The 196 nozzles give a wide coverage without losing the water pressure. The stainless steel design does not hold fingerprints and looks quite stylish. The showerhead is available in a smaller size as well and without LED lights also. The red LED light for hot water can seem a bit irritating for some users. The lights stop syncing with water temperature after using it for sometime. This showerhead uses a very novel concept with LED lights and provides a spa-like experience as the lights change according to the water temperature you choose. It is also available in a smaller size and the 10″ showerhead is great for getting a rainfall shower. We have saved the best for the last and the brand Kohler is a well-known name in the bathroom fittings industry. 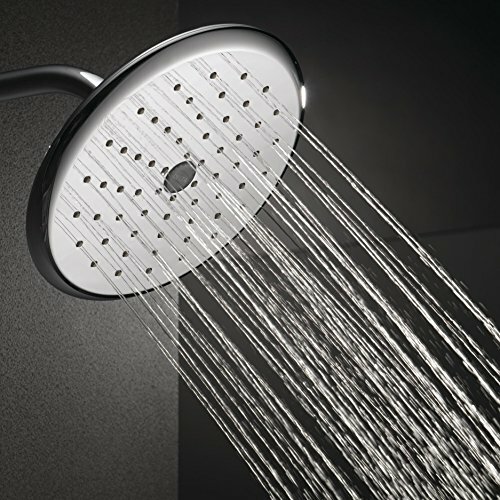 Unlike most rain showerheads which are square in shape, the Kohler rain shower head is a round showerhead and uses Katalyst Spray technology which sprays water in a drenching rain pattern. The nozzles fitted on the showerhead are translucent and are made using Masterclean technology which does not allow a lot of mineral build-up. This showerhead is available in two colors namely polished chrome and vibrant brushed nickel. The price of the showerhead is very high due to its low-profile design and brand name. The spray technology used in this showerhead gives a dense and uniform spray which covers the whole body. The showerhead is very easy to clean and the translucent nozzles reduce mineral build-up. The low-profile fitting makes the showerhead look striking against the remaining bathroom fittings. Both the color options available in the showerhead are very stylish. The price of the rain showerhead is very high as compared to other models. The lower setting needs extra plumbing which can take a lot of time and investment. This rain showerhead might sound like a bit investment but the finish and design of this showerhead is unparalleled. Its low-profile setting and the dense spray technology give you a great showering experience. 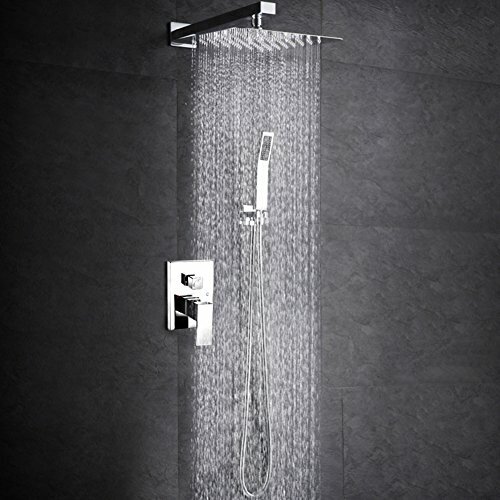 This type of showerhead is designed to make the water fall in a drenching pattern like rainfall. The water falls evenly in a steady stream and makes you feel like you are standing in the rain. Rain showerheads are typically installed in hotels and public spaces where users are treated to a luxury experience of rainfall shower but they are now being installed in homes as there are a few affordable but great models in the market. The nozzles of this showerhead are arranged in horizontal and vertical lines and are spaced very closely. Rain showers differ from the traditional shower heads in a way that they come with multiple nozzles spread evenly on the showerhead surface instead of a few concentrated nozzles. If you compare the rain shower head vs regular shower head, this showerhead is larger in size and is installed directly overhead. The rain-like spray setting covers the whole body and is very unique as compared to the normal round shower heads. They are also a little expensive as compared to regular shower heads and the multiple nozzles can be a little more difficult to clean because of the lack of space between them. 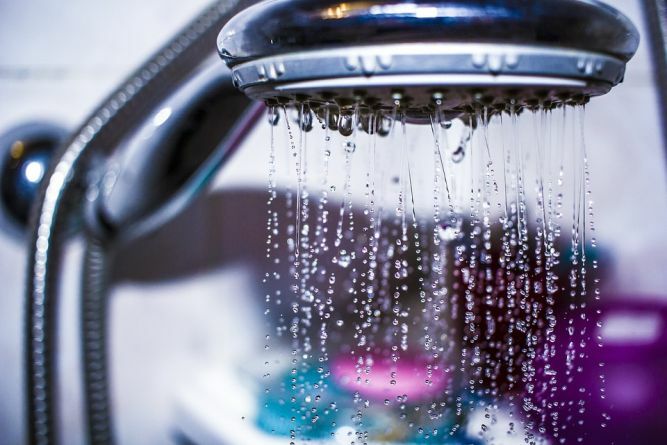 Another difference between these two types of showerheads is that the water pressure in rain showerheads can feel a little less to users who are used to the water pressure of regular shower heads. If you talk about assembly, some models can fit well into the existing fittings but some models require some additional plumbing. Give the user a drenching rainfall-like showering experience which is soothing for the body and the mind. These showerheads usually function at a lower water pressure and use less water as compared to regular showerheads. These showerheads give you a steady and even water flow and are directly installed overhead which helps in the consistent flow of water. Rain showerheads look quite aesthetic and look pleasing to the eye because of their thin and lightweight design. The coverage provided by this type of showerhead is much higher than traditional showerheads. Some of the models also come with lighting effect wherein the LED lights change their colour when the water temperature is changed. The price of these showerheads is comparatively higher than regular showerheads because of the multiple nozzles and larger design. They might need some additional fittings and disturb the existing plumbing of your bathroom if you choose a model which does not fit the existing shower arm. People who prefer a very high water pressure might not find these showerheads up to their expectations. What to look for when buying the best Rain Shower Head? Most rain showerheads come with a width of 10 to 12 inches as they are designed to cover a larger area and provide an authentic rain shower experience to the user. Some models also come in 8 inch so choose according to the size of your bathroom. 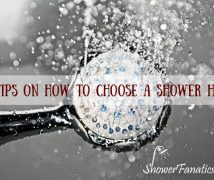 You can choose between a round and a square rain shower depending on your preferences. The most common finishes in this type of showerheads include brushed nickel, chrome, oil-rubbed bronze, and copper. Chrome models are generally preferred as they go well with the existing bathroom fittings. Typically, a rain showerhead is mounted directly overhead to get the right experience but they can also be attached to any standard shower arm. If you do not want to disturb your existing shower fittings or plumbing, you can go for the latter. Since these showerheads come with multiple nozzles, their durability can be a bit of an issue but this can be fixed if they are installed properly. Check the durability of the showerhead model by reading its reviews or checking with users who have already purchased the model. Almost all rain showerheads are made up of stainless steel since it does not rust and is quite durable. Installation is pretty easy and it is advisable to go for models which are easy to install as disturbing the existing plumbing of the house can demand a lot of extra investment. This is one of the most important criteria to consider as the spray type is what the rain showerhead is all about. The spray should be uniform and consistent. Look for settings which work for you as some models come with a single spray setting. Rain showerheads offer a generally lower water pressure as compared to other regular showerheads as it covers a wider area and the stream is not concentrated so choose accordingly. Most of the models offer a 2.5 GPM flow rate so there are not many options to choose from. You can get a good rain showerhead in the range of 40$ to 300$ depending on the brand you choose and the design. Avoid going for very cheap models which do not provide the intended experience. 1. What is the Best Rain Showerhead brand? In our opinion, Hansgrohe is the best rain showerhead brand. It might seem a bit expensive but the AirPower technology used in the showerheads makes the users feel like they are standing under natural rain showers. The size of the showerhead is also comparatively larger than most rain showerheads available in the market and the finish is completely worth the price. 2. 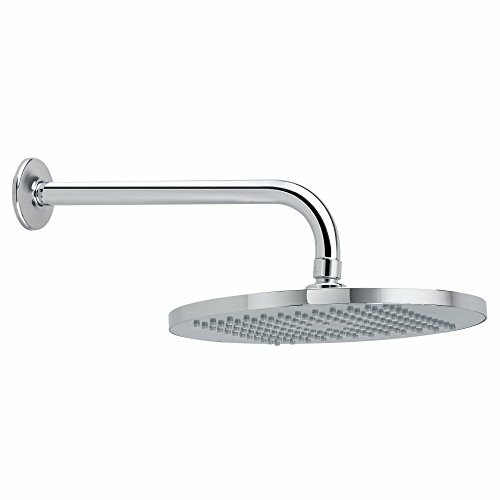 How much do I need to spend for Rain Shower Head? With rain showerheads, it is better to invest in a quality product as these are one-time investments and the quality of the showerhead determines its durability. 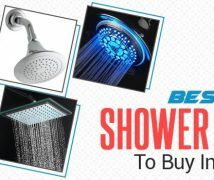 A good rain showerhead costs around 100$ and this is the amount you should spend on purchasing a good and durable showerhead that gives you an authentic rain shower experience. 3. 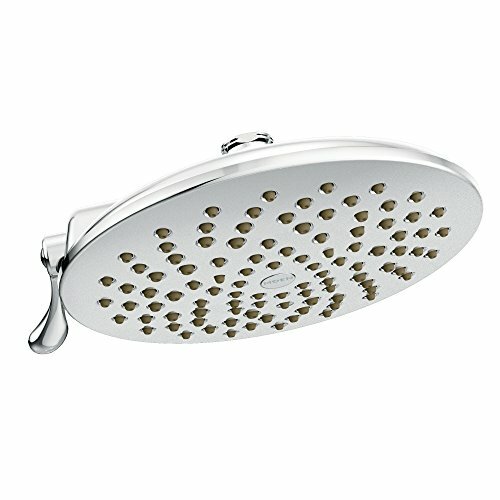 What materials are good for rain shower head? Chrome-plated ABS and stainless steel are some of the good materials that are used for making rain showerheads as they does not corrode and shows signs of rust unlike other bathroom fittings. They are also quite durable and last for years looking as shiny as ever. Nickel is also used in some showerhead models. 4. Which is the best Ceiling Mounted Rain Shower Head? The American Standard 10″ showerhead is a great option to consider if you are looking for a ceiling-mounted rain shower head as it is very sleek and is quite easy to install too. The mild water flow with a relaxing feeling is something that this showerhead is known for. 5. 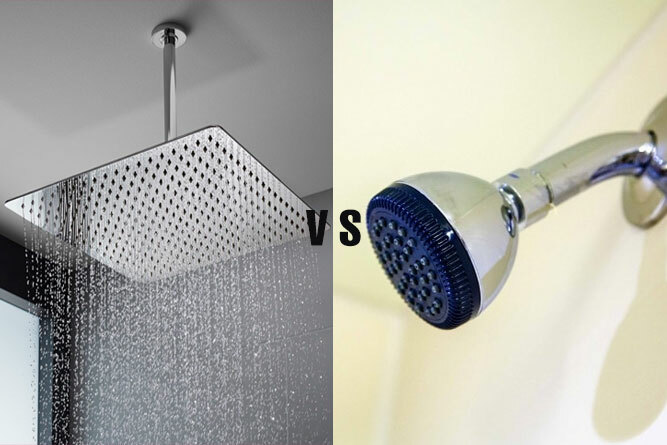 Which is the best Wall Mounted Rain Shower Head? The Kohler K-13688-CP is the best wall mounted rain shower head available in the market as it looks extremely classy and has a minimalist design which will transform your bathroom into a luxurious bathing space. The low-profile setting and the Katalyst spray technology of the Kohler rain shower head make it worth the high price. 6. Which is the best Rain Shower Head with Handheld Spray? The SR Wall Mounted Rainfall Shower Head System comes with a showerhead and a handheld spray for creating the ultimate showering experience for your bathroom. It also comes with a mixer and a shower bracket so it is the best rain showerhead with handheld spray if you are looking for the best rain shower system for your bathroom. 7. How to Install Rain Shower Head? 7.1 How to install a ceiling mounted rain shower head? Ceiling mounted rain shower head is a little difficult as compared to installing a showerhead on a shower arm but this type of installation makes your showering experience a lot more real. It is better to do this installation when you are constructing a new bathroom or remodeling the old one. 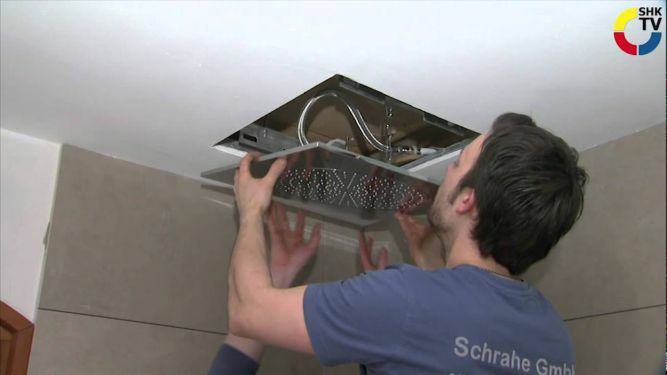 For installing a ceiling mounted rain showerhead, you need to find the existing water line and install additional plumbing to connect the main line to the position where you want to install. This will create a square hole in the ceiling so it is better to call a certified plumber to install this model. 7.2 How to install rain shower with handheld? Installing a rain shower with handheld shower is easy as you only need to remove the old showerhead and Teflon tape before tightening the shower holder diverter and then ensuring that the rubber washers are fitted correctly on both ends of the hose. Tighten the handheld shower head on one end of the hose and then connect the hose to the holder which is then connected to the main shower line along with the rain showerhead. 8. Are Rain Shower Heads worth it? Yes. Rain showerheads take your mediocre and normal morning showers to moments of bliss and connect you to your senses like natural rains do. They are worth the investment if you are looking for a change in your showering experience. 9. What is the standard height for a Rain Shower Head? The standard height for a wall-mounted showerhead is 6 feet and 6 inches and in case of ceiling-mounted rain showerhead, it is according to the height of the ceiling. 10. Do Rain Shower Heads use more water? No, this is not necessary as most rain showerhead models divide the same amount of water into a steady stream. In fact, rain showerheads conserve water in the long run. 11. Which is the best Rain Shower Head for Low Water Pressure? The Delta RP52382 is a good choice if your home has a low water pressure situation as it is available in two variants depending on the flow rate you prefer. It is one of the best rain shower head for low water pressure. 12. 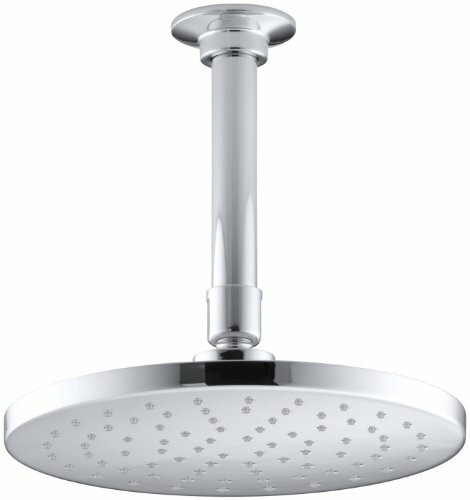 Which is the best Rain Shower Head with Adjustable Arm? Any rain showerhead which swivels in all directions works well with an adjustable arm. The Delta RP52382 is the best rain shower head with adjustable arm and comes with an option to install an additional adjustable arm for added comfort. In our opinion, after going through some of the best rain shower heads, the Moen S6320 tops our list with its spray settings and quality. If you are looking for a budget-friendly model, go for Waterpik RPB-173 which is quite affordable and great in terms of installation and maintenance. 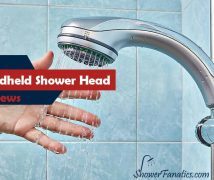 We hope that this detailed comparison guide along with rainfall shower head reviews would help you find the best rain showerhead for your bathroom easily. 3.1 What is a Rain Shower Head? 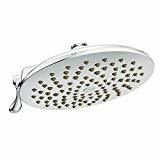 3.4 What to look for when buying the best Rain Shower Head?